How Can One Little Infant Create So Much Guilt? This mother is telling my story. She may even be telling your story. How many of us have struggled with our child when they were an infant… feeling like we oarless in the sea. Today we welcome Ashley from Sewrite, who shares her story with such wonderful honestly. Shortly after our first daughter, Madeleine, was born, both my husband and I felt something was not right. Until Maddy was eight months old, she was still waking every two to three hours at night, and sometimes would nap a total of 20 minutes the entire day. When we introduced solids at six months, she couldn’t stand them. To this day, there are only a couple of things she will consistently eat, like avocado and chickpeas (and some days she won’t even eat those). On top of this, she was not happy. She cried a lot. She constantly needed us, or, more specifically, me to be holding her… but not just holding her, bouncing her non-stop. But, even though she needed me holding her, it seemed to me that she hated being held. HATED. She would squirm, cry and push away from me. She never would let us hug or cuddle her. While nursing, if I touched her at all she would squirm and push my hand away. In fact, if she seemed happy, I was afraid to move her, look at her, or make a sound for fear that it would all change in an instant. At nine months of age, the only improvement we had seen was that some nights she would sleep four or five hours straight. In fact, at nine months old, we had never heard Maddy really giggle. I mean, really giggle. Very infrequently she’d let out a small giggle, but you know the kind of giggle I’m talking about. The kind people video tape and put on You Tube. In fact, when she smiles, we still exclaim, “She’s smiling!” and run to get the camera… because it’s just so rare. Despite noticing all of these things, I let my inner voice, and the voice of friends and family who told me many times to follow my gut, get stifled by well-meaning others who constantly told us how pleasant and healthy Madeleine was. I can’t blame them… she did always seem to be more pleasant when visitors were around or when we were out in public. Combine that with her food intolerances and teething issues, and things get confusing quickly. I eventually stopped talking about our struggles, because the reactions of others started convincing me that I was the one who had the problem, not Madeleine. I went as far to ask my husband, Eric, if he thought it was possible I had postpartum depression without knowing it. Don’t worry, I’ve also addressed this with professionals and do not have it. It was to the point that I had just decided I must be crazy or an incompetent mother. Even my own parents, who had heard me talk about her crying and the difficulty I was having at home, didn’t fully get it until they spent a weekend at our place. Prior to this visit, my mom had said to me over the phone that her and my dad understood that I wasn’t enjoying motherhood. I’m embarrassed to say that my response was, “That’s because I’m raising a devil child.” And, I’m sure you’ve guessed… they were right. They were so right. Not only was I hating being at home, I was hating being at home with Madeleine. I was doing everything in my power every day to try to get her to play on her own…. to not need me so much. She was sucking every ounce of energy out of me and then demanding more. I was starting every morning on empty. I was dragging myself out of bed every day, resentful of the fact that Eric got to escape to work. These feelings didn’t come easily. In fact, they riddled me with non-stop guilt. Guilt that I hated being around my daughter. I feared that she felt unloved, and that I was doing harm to her emotional development. Deep down I just knew she was feeling how resentful I was. I was worried that her unhealthy attachment to me was a result of her understanding how miserable I was with her. That it was her begging me for love. I felt horrible guilt when my arms were just too tired, and my patience too thin, and I’d sit her on the ground to cry. She’d look up at me with her big, sad eyes, tears rolling down her cheeks as she cried, “Mama, mama, mama.” I would cover my head with a pillow so I wouldn’t have to see her, but all I could think was what a terrible mother I was… how if people really knew, what they would think of me. How any mother who loved her child couldn’t do this to them. This series of her crying like this while I covered my head didn’t happen infrequently. It happened multiple times a day. Sometimes as many as ten times a day. It’s a terrible feeling that even after giving everything you’ve got to your child, it’s still not good enough. Let me remind you that while this was going on, the message society was sending me (whether intentionally, unintentionally, or whether it was solely my perception) was that babies cry. Everyone else can manage. Why can’t you? On the weekend visit with my parents, they came to the same conclusion Eric and I had long ago. Something was not right. Like us, they couldn’t exactly pinpoint what the problem was. Maddy could go from happy as a clam to angry, full-out meltdown in less than a minute. I’m pretty sure the only time my parents saw Maddy smile the entire 22 hours they spent here was the ten minutes she spent on a swing in the park. They really pushed us, saying that we need to be making appointments and demanding that someone look into this…. not just for Maddy but for us too. Like parents often are, they were right. Our house was filled with so much stress, it surely wasn’t good for us. In fact, if Eric and I didn’t have such a solid relationship with good communication prior to having Madeleine, I’m not sure we would have made it this far. Eric started making some suggestions based on observations he had made. Maddy was always happiest first thing in the morning, and last thing at night… when she was in her disposable diapers and sleepers. So, we started leaving her in that all day. Wouldn’t you believe… things got slightly better. Initiated by this train of thought, we started thinking that she was maybe having some sensory processing issues. We were lucky to get our hands on the Infant and Toddler Sensory Profile Questionnaire for parents and discovered Maddy just might have some sensory issues. We followed up with an occupational therapist at a multi-disciplinary pediatric health center for children with developmental and neurological challenges. 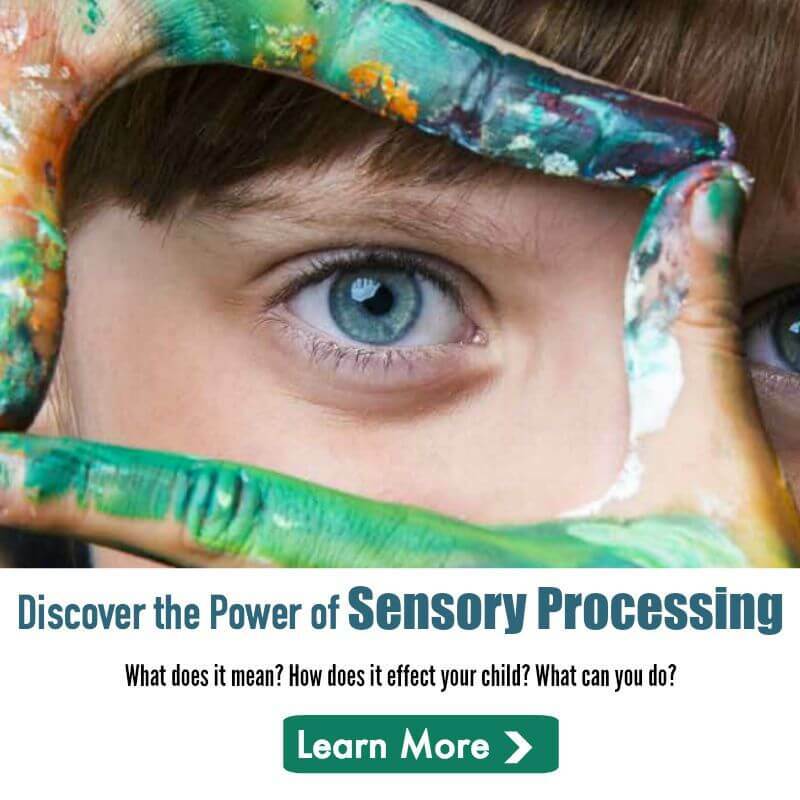 It wasn’t long before we knew – our sweet, little Madeleine was identified as having Sensory Processing Disorder. 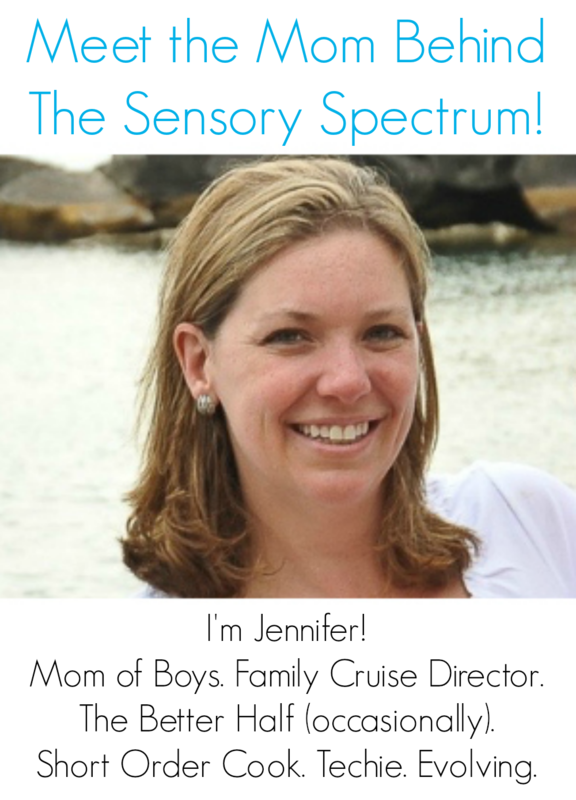 What are my feelings about Madeleine having a sensory processing disorder? Relief, resentment, fear, sadness, hopefulness. I was relieved that finally someone had heard us. Our experiences with Madeleine were being validated. I wasn’t crazy, and I am not a terrible mother. That quickly transitioned to resentment and fear. I was resentful that so many other people have happy, easygoing babies… and we have Madeleine. Fear of what a diagnosis might mean for the future of Madeleine and our family, both emotionally and financially. Fear of the struggles she could face socially, emotionally and educationally because of this. Then I felt incredibly sad. Sad that I can’t control this. Sad that I can’t make Maddy feel good or happy. Sad that I can’t prevent Maddy from being hurt, from feeling pain or from having struggles in life. Next, I felt hopeful. Hopeful that Maddy would respond well to therapy and, that with early intervention, most of these issues would be mitigated. Hopeful that this struggle would make our family stronger, more loving and able to tackle anything. What words of advice can I offer after going through all of this? To parents: trust your instincts. You know your baby better than anyone. Don’t let the judgemental looks or well-meant comments question yourself. To friends, family and strangers who see or hear about parents who are struggling: don’t assume you could do it better. Don’t ask a stranger in public if she’s hurting her baby (yes, this happened to me). Don’t tell them that “babies cry.” Don’t tell them that they’ve spoiled their baby. Don’t judge. Please, don’t judge. We do a damn good job of judging ourselves already. In fact, we do a much better job of judging ourselves than you could ever do. The only thing that makes going through something like this worse, is the feeling that you’re doing it all alone. Trust me on that. I am so not alone with a ton of support from Eric, and our friends and family… but I still feel alone at times. Lastly, I assure you, that if you could spend one week in my shoes, you would understand. You would get that it’s not that Maddy’s spoiled, it’s not because she’s a baby, and it’s not because of the way Eric and I have raised her. She is who she is. She’s a unique, beautiful, strong-willed, determined baby who is struggling and can’t communicate how she’s struggling. Please, I beg of you, listen to parents like us without judgement. Offer them the emotional support and friendship that is so needed in difficult times like these. They are reaching out in the best way they know how for your support. Know that the hardest part of looking you in the eye and admitting these feelings to you, is that they are admitting to themselves that this is their reality. This post originally appeared on Sewrite. You can read more from Ashley there.